Approximately 15 minutes east of Gatesville, less than 2 hours from Dallas or Austin, and 30 minutes from Waco. The ranch is easily accessible, with over 1.3 miles of paved CR 267 frontage. Drop dead gorgeous ranch in a beautiful neighborhood of quality ranches. Pride of ownership is evident from the time you drive through the gate. The owners have taken great care of improving and maintaining the land. Much of the cedar has been cleared, leaving a park of Live oaks, Chinkapin, Burr, Black Jack oaks, Elm, Black Walnut, and Pecan trees. There is approximately 100 acres of improved pasture. The land has varied terrain with over 150 foot elevation change. There are big, picturesque views from the upper elevations. There are no ingress/egress easements through the ranch. Absolutely incredible live water. 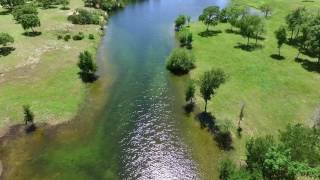 Over 1.3 miles, both sides, of clear flowing Coryell Creek winds through the ranch and 3 concrete dams create tremendous fishing and swimming areas. The creek did not go dry in the recent drought. It is rare to find a property offering easy and unrestricted access to both sides of beautiful and continual flowing water. Much of the brush has been cleared on the creek, allowing hiking and fishing along the banks. In addition to the creek there is a large lake, stocked with bass and clear enough to swim in, and a pond on the hill. Like the creek, the lake and pond did not go dry during the recent multi-year drought. A very nice 2-1 home has been remodeled and makes a great weekend residence. Sit out on the covered front porch and enjoyed the view of the lake. Water to the house is supplied by Mountain Water Supply. In addition to the house is an implement barn, with concrete floor. The ranch has not been hunted in years and there is an abundance of game, including deer, turkey, dove, and ducks. Recreational opportunities are endless and the productive land is geared for cattle or horses. The ranch is currently under an Agricultural Wildlife Exemption. If you are looking for a ranch that has loads of character, fantastic water, and is ready to go, then the Creekside Ranch is worth a look. Just hang up your cloths, put up your toothbrush, and start enjoying. From Gatesville, go 7.5 miles east on 84 and a left on 267. Go 1.5 miles and veer left, still on 267 for another mile. Property on the left.